STOP HS2 | PMQs: Cameron dodges the question, but says Brexit costs less than HS2. PMQs: Cameron dodges the question, but says Brexit costs less than HS2. Today at the final Prime Ministers Questions before the EU Referendum, whilst the more interesting action seemed to be taking place just outside Parliament with Votey McVoteface appearing on the Thames, the entire proceedings were not surprisingly taken over by the campaign ahead of the referendum next Thursday. That was the case right up until the very last question about the need for HS2 from Christopher Chope MP. Whilst Cameron originally called the EU referendum, Chope whose Christchurch seat puts him very much off the route when it comes to HS2, tried in the last Parliament to take this approach a bit further, calling for a referendum on HS2 itself. “It’s behind you! !” – George Osborne fails to spot a clue to something which could be cut if there was a need for an emergency budget. 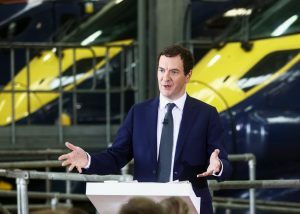 Earlier in the day, at a press conference in front of parked HS1 Javelin trains with “Britains’ Fastest” plastered on their sides, Chancellor George Osborne had said he would have to slash public spending and increase taxes in an emergency Budget to tackle a £30bn “black hole” if the UK votes to leave the European Union. He delivered his speech without the slightest hint of the irony, that right behind him there was a rather large clue as to what he could cut to get back more than that amount of cash in the event of a Brexit downturn. Indeed, all he would have had to have done was talk to the Prime Minister who last week was willing to say HS2 is under threat from Brexit, maintaining his bizarre detachment from reality that HS2 is somehow a vote-winner. As pointed out in our article yesterday, one of the noticeable things about the EU referendum campaign is that some of the tactics being used echo those used by the campaign for HS2. There is a clear parallel between the paid for pro-HS2 reports from the likes of KPMG & Greengauge 21, and those about the EU & Brexit from the IFS and NIESR, as both of those bodies receive EU funding. This has to raise the question as to whether or not those organisations are as ‘impeccably independent’ as the PM suggests, however, even if you were to take those estimates of a £20 to £40bn hit to the economy at face value, that’s significantly less than the current official under-estimate for the cost of HS2 of £56bn. So, with a completely incomprehensible attitude from Government that HS2 is a vote winner, what they seem to have demonstrated is that even if there were to be an economic shock related to a vote to leave the EU, all that would have to happen is for them to cut HS2, which Cameron has already threatened might be the result, and we’d still be up on the deal. And this is meant to convince people to vote to Remain? There are certainly more than a few impacted by HS2 who now will be thinking very much the other way.